Enoch Mgijima, one of nine children, was born at Bulhoek, about 25km southwest of Queenstown, in 1868. His father, farmer Jonas Mgijima, was among those Mfengu people who accepted land from the British in a buffer zone - Ntabelanga, or Bulhoek - in return for their support. The British saw the creation of buffers as a way of getting "friendly" Africans to protect white settlers in wars with other Africans, and also as a way to supply white farmers with nearby sources of cheap labour, writes American academic Robert Edgar in his book, Because they chose the plan of God: The story of the Bulhoek massacre. Many of the Mfengu families tried to adopt British ideas. They built square houses, wore Western clothing, went to mission churches (Wesleyan/Methodist and Presbyterian), and sent their children to mission schools. Many lived off the land and sold their surplus produce. Some earned money through skills such as building and carpentry. Some had their own shops. This did not last. Rinderpest decimated cattle herds in 1896-97 and drought swept through farming areas. More importantly, Edgar says, the white government saw prosperous African farmers as a threat to white farmers and mine-owners. Higher taxes were imposed to force Africans to work for whites and laws were passed to force Africans off the land. The most devastating of these laws was the 1913 Native Land Act. Mgijima, meanwhile, was to be sent to Lovedale college. He left school after Standard Three because he suffered from severe headaches. He later became a farmer and also a lay Wesleyan (Methodist) preacher. On April 9, 1907 Mgijima had his first vision: an angel told him he had to educate people and get them to worship God in the Old Testament traditions. The angel told him of the coming of a great war and the end of the world. The faithful would be saved. The angel told Mgijima of the coming of a great war and the end of the world. The faithful would be saved. After much soul-searching, Mgijima began preaching and acquired a large following. When Halley's Comet streaked through the sky in April 1910, he saw this as a confirmation of his vision. In 1912, Mgijima began baptising his followers, who he called "Israelites", in the Black Kei River near Ntabelanga. The gospel he preached coincided with the beliefs of the American Church of Gods and Saints of Christ - the Sabbath fell on Saturday, they held services four times a day, and their main festival was the Passover in mid-April. In 1919, Mgijima's followers from around South Africa began gathering at Ntabelanga to pray and await the coming of the Lord. By 1921, some 3 000 Israelites had gathered there. Edgar points out that pressures on black people at this time were starting to increase, and this was compounded by the 1918 flu epidemic that killed 1 000 people in Mgijima's region, and a devastating drought in 1919. For many people, "Mgijima's prophecies offered one alternative - of dramatic change, hope, salvation, comfort, solace - that was extremely attractive," Edgar writes. "The outside world might be antagonistic and hostile, but at Ntabelanga, Mgijima promised a reversal of roles. The outcasts were now God's chosen and blessed ones." Israelites would, in fact, gather every year at Mgijima's home for Passover and worship in a "tabernacle" made of patched-together tents. In early 1920, Mgijima applied to white authorities earlier than usual for permission for his followers to attend the festival as, he told them, many people were coming from far away. Local inspector of African locations, Geoffrey Nightingale, was initially reluctant to give the go-ahead, but capitulated when Mgijima assured him his followers would not stay for good. When the inspector visited the village in June, he saw that Israelites had built more houses, but Mgijima said many people had not been able to leave for various reasons. Nightingale reluctantly allowed them to stay for a short while. More Israelites arrived. Mgijima's prophecies offered one alternative - of dramatic change, hope, salvation, comfort, solace - that was extremely attractive. By September, Nightingale believed up to 1 300 Israelites were at the village, most illegally. The authorities summonsed 20 Israelites for squatting. Still they came. "We humbly beg you to give us a chance to pray," two Israelites wrote to a Queenstown magistrate. White authorities were getting jumpy and spoke to police and Native Affairs officials in Pretoria, who urged that the Israelites be persuaded to leave. White farmers began accusing Israelites of stealing cattle; some black neighbours complained that Israelites were using their lands. Meanwhile, a permanent settlement, with streets, brick houses, a nursing brigade and even a court for religious violations, had been established at Ntabelanga. White officials knew now that the Israelites did not intend to leave. Several delegations attempted to persuade the Israelites to leave the land. One of these - a group of black leaders, including JT Jabavu, and a delegation of 100 policemen brought in from elsewhere - beat a hasty retreat, abandoning their tents and supplies when a group of Israelites approached them. The Israelites told a delegation that included Native Affairs Secretary EJ Barrett that they would not leave without a message from God. Mgijima's brother, Charles, told this delegation: "God sent us to this place. We shall let you know when it is necessary that we go." Even Prime Minister Jan Smuts was urged to go to Bulhoek, but Smuts was otherwise engaged in contesting an election and further delegations to the Israelites were put off until early April 1921. The Israelites, meanwhile, followed many Eastern Cape African communities in refusing to pay taxes. A delegation in April consisted of the new Native Affairs Commission - its first mission, in fact. They told the Israelites God worked through them too. "But the Israelites rejected that. To them, Jehovah only worked through one prophet and that was Enoch," Edgar writes. Again, there was no compromise. The commission was sent to the village again on May 11. It was enough: the authorities would court no further embarrassment and challenge to white authority. The head of the police, Colonel Truter, ordered that 800 policemen be brought to Queenstown. "It was the largest force of police that had been put together in peacetime in South Africa," Edgar writes. The whole world is going to sink in blood... The time of Jehovah has now arrived. On May 21, Truter told the Israelites to leave or police would arrest Mgijima and demolish houses. Mgijima responded by letter: "The whole world is going to sink in blood... The time of Jehovah has now arrived." Mgijima had another vision: the police would come from many directions and he had seen his people falling. He told his followers they were free to leave. They stayed. His nephew, Barrington Mgijima, told him: "If you see death here, let the death begin with us Mgijimas." So Mgijima told his men: "You go and die for the Lord's sake, but this is no death." The 800 policemen began arriving at Ntabelanga on May 23. At 9am on May 24, they moved into position in five detachments on slopes overlooking the village. At 8.40am, the Israelites ended their morning service and marched outside for their usual drill. Police thought they were watching a war dance through their binoculars. With Charles Mgijima as the commander, about 500 Israelite men split into five regiments according to age group. They were armed with knobkerries and a few spears. The women and children remained in the tabernacle, praying and singing. At around midday, a conversation - to no avail - took place between three Israelites and three policemen. A little later, the police again asked the Israelites to surrender. Edgar says the beginning of the massacre is open to dispute. The police claimed Mgijima's men jumped into battle and that they fired in self-defence; the Israelites claimed the police fired first. "It may be that someone fired a shot by accident and then both sides might have clashed since everyone was very tense," Edgar says. The battle itself is not in dispute. The Israelites wore white robes - easily visible targets as they ran towards the police - and the police "rifles and machine guns sliced through the men". The Israelites continued charging. Even wounded men moved forward until they collapsed. Mgijima stood in a prominent place and wore a red robe so police could easily see and recognise him as the leader, according to Dr Phila Shweni, a church spokesman. After the battle, Mgijima prayed with the women and children: "Is the blood required by you enough? Have enough Israelites been sacrificed?" In a battle that lasted less than 20 minutes, at least 183 Israelites were killed. "Oral history among members of the church has it that the death rate was as high as 800," says Denver Webb, the Eastern Cape historian who has worked to preserve the Bulhoek site. Almost 100 were injured. Enoch, I hold you responsible for all this bloodshed. Among the police, one was stabbed and a horse died. With the battle over, the police advanced on Ntabelanga and seized Mgijima. Truter told him: "Enoch, I hold you responsible for all this bloodshed." Mgijima replied: "You take your orders from the government. I take mine from Jehovah." Mgijima and his brother Charles were among the 150 Israelites arrested and held in the Queenstown jail. That night, the surviving Israelite men dug graves. "It took the remaining Israelites four days to bury the dead in three mass graves," according to the author Denver Webb. Soldiers began tearing down the Israelites' homes. The arrested men and their leader were charged with sedition and found guilty. The judge told them they had "a crazy notion that the day was coming when the black man would have his freedom". Enoch and Charles were given six years' hard labour, the followers between 12 and 18 months. Charles died in prison. Enoch Mgijima was released in 1924. After his release he and other survivors of the massacre began building the tabernacle at Queenstown. Mgijima died on March 5, 1928, but the Israelite church has endured. The Queenstown tabernacle is today the headquarters of the church, although Bulhoek will always be its spiritual home. Known today as the Church of God and Saints of Christ, the Israelites have congregations throughout the Eastern Cape and the church is growing in other parts of the country. The Israelites commemorate the massacre annually. Members of all tabernacles fast on May 24, and a commemoration takes place at Bulhoek on the first Sunday after May 24. "This was one of the first times after the union of South Africa that the white government used police and army troops to crush a group of Africans who would not obey its laws. Unfortunately it has not been the last," Edgar notes. According to Webb: "For members of the church, the events of May 1921 have an immediacy which is difficult for outsiders to grasp... Members interpret the event in a strictly religious way and eschew any political dimensions to the massacre. As far as they are concerned, the massacre was simply the fulfilment of the scriptures." "You take your orders from the government. I take mine from Jehovah." In this lesson plan, learners are encouraged, through their study of historical documents, to explore the reasons for a religious group risking their lives to defy General Smuts's government in 1921. Learners will also be asked to think about why the government and its police used violent force against the so-called Israelites. 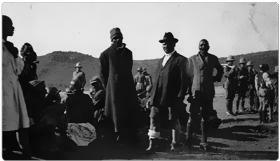 A selection of photographs of the Bulhoek Massacre, courtesy of Museum Africa. Photographs of the memorial and Church of God and Saints of Christ congregants, taken at an unveiling ceremony.